For the May Member of the Month, the Line Office and Civil Office would like to recognize someone who has gone above and beyond, someone who is routinely putting in extra effort, someone who is clearing to drive on apparatus, someone who is checking equipment, and someone who is helping out whenever they are asked to do so with the best possible attitude. We would like to recognize is CJ Kouzan as the West Webster Member of the Month for May 2018. CJ joined West Webster after being a member at the Hopewell Fire Department in Ontario County. CJ’s positive attitude and growth mindset allow him to always learn and ask questions. CJ has become a positive role model for the members of the West Webster organization. 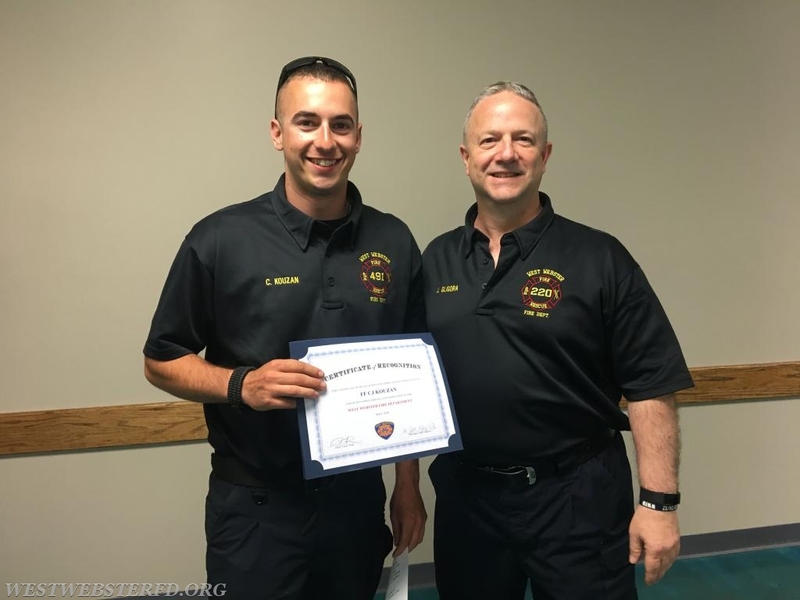 Since joining West Webster, CJ has been a dependable responder, member of a nighttime team, working diligently on clearing to drive apparatus, and taking training above and beyond the minimum we require. It is for these reasons and more that we would like to recognize CJ Kouzan as the West Webster Member of the Month for May 2018.